Nate Coulter, executive director of Central Arkansas Library System (CALS); Amy Webb, Chief of Communications and Community Engagement, Arkansas Department of Human Services (DHS); and Governor Asa Hutchinson will announce a new effort to keep Arkansans insured. Governor Hutchinson will join Coulter and Webb to announce a new partnership between CALS and DHS to help Arkansans get the proper information about Arkansas Works. CALS staff members have received training from DHS to assist people in signing up for Arkansas Works reporting. Staff can help patrons create an account, navigate the portal website, and scan and upload supporting documents. On some occasions, depending on branch staffing needs, and on the level of assistance that is required, staff may ask patrons to schedule a future appointment rather than providing immediate help. Patrons may also call ahead to schedule an appointment. This week as part of Arkansas Heritage Month’s focus on the arts, we will be looking at seven recipients of the Governor’s Arts Awards from Little Rock. 2016 honoree in Arts Community Development, Dr. Dean Kumpuris has spent the last three decades working to improve the cultural and civic life of Little Rock. In particular, he has focused much of his work on the revitalization of downtown, the development of the River Market, and expansion of Riverfront Park. Through his vision and efforts to place public art downtown, in less than 10 years, nearly 100 sculptures have been installed in the Vogel Schwartz Sculpture Garden, as well as in parks along the Arkansas River and throughout Little Rock. He created the annual fundraiser, Sculpture at the River Market Show and Sale, which attracts thousands of visitors to Little Rock each year and features hundreds of sculptures from internationally recognized artists. He is a gastroenterologist and has served on the Little Rock City Board of Directors since 1995. The Arkansas Arts Council will present the 2016 Governor’s Arts Awards today at the Arkansas Governor’s Mansion. Sponsored annually by the Arkansas Arts Council, the Governor’s Arts Awards recognize individuals and corporations for outstanding contributions to the arts in Arkansas. The recipients were nominated by the public and then selected by an independent panel of arts professionals from around the state. Each recipient will be honored at a ceremony in the spring and will receive an original work of art created by Arkansas artist Kelly Edwards. The selection committee members included Mildred Franco, Arkansas Arts Council board, Pine Bluff; Ed Clifford, The Jones Center, Bentonville; Aj Smith, University of Arkansas at Little Rock; Chris James, The Roots Art Connection, North Little Rock; and Cathy Cunningham, Southern Bancorp Community Partners, Helena. President Clinton’s birthday is next week. But the Clinton Presidential Center is offering visitors the present. Today from 9am to 5pm, the Clinton Presidential Center admission fees will be waived. Also offered for free will be the audiotour featuring President Clinton’s narration. 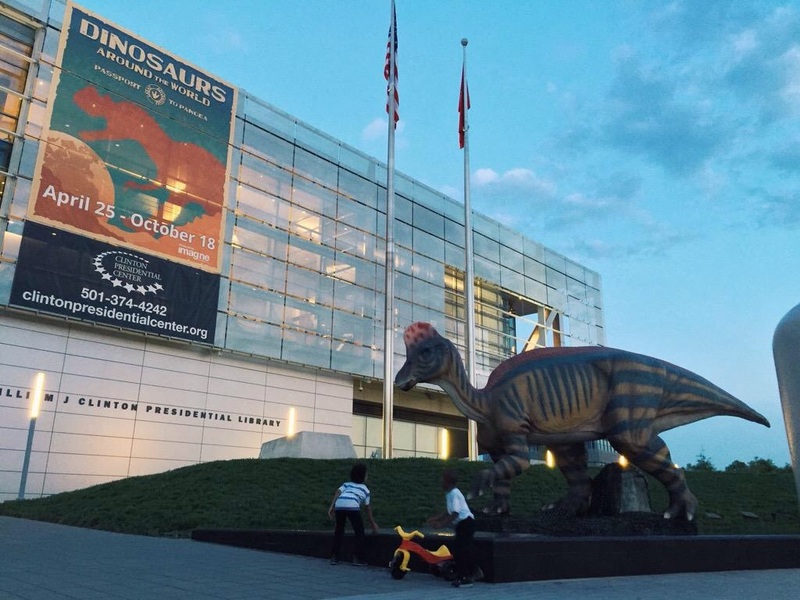 In addition to the chance to visit the Dinosaurs exhibit and the permanent exhibits, the Clinton Center is hosting a special event today from 9am to 2pm. Kick off the new school year at our Annual Head of the Class Bash. The first 1,500 students will receive FREE backpacks and back-to-school supplies! The Clinton Center will also provide immunizations, haircuts, fun activities, ACT/SAT/PSAT prep coupons, and much more. New this year, there will be “Hour of Code” computer science tutorials. The Head of the Class Bash is sponsored by the Clinton Foundation in partnership with the 3M Company, Arkansas Department of Health, Arkansas STEM Coalition, AT&T Arkansas, New Tyler Barber College, and the Office of Governor Asa Hutchinson. Head of the Class Bash: 9 a.m. – 2 p.m.
Free Admission Day: 9 a.m. – 5 p.m.